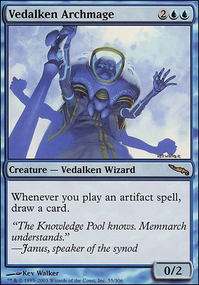 Can I use my opponents Memnarch to retain control? 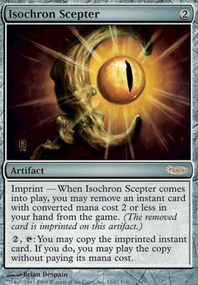 Can I use Fabricate to tutor a Blightsteel Colossus or a Sundering Titan? Can planeswalkers be indestructible and what would that mean? : Gain control of target artifact. (This effect doesn't end at end of turn. - Mill. IMO this is the weakest/least supported. Recommend cutting these cards (especially since you're not playing any wheel effects). - Creature Copy/Stealing. 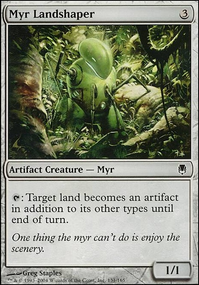 This one is also pretty thin, but if you keep it consider adding Memnarch (flavor win!) and Rite of Replication . - Thopters. This is worth keeping with a little more support. 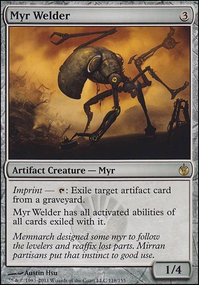 Consider adding Hangarback Walker . 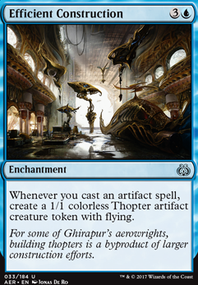 Maybe Sharding Sphinx ? If you do go harder on this strategy, look at Favorable Winds . - Card draw. 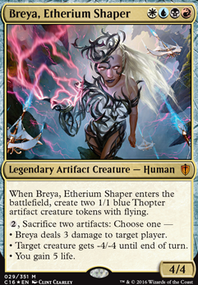 Already strong, but with this commander I'd go for even more. 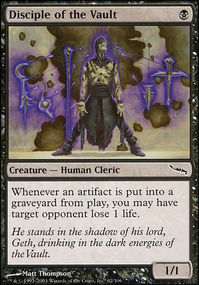 Surprised not to see any of the X draw spells like Pull from Tomorrow . Another idea is replacing counter/unsummon effects with cantrip versions like Exclude or Drag Under . 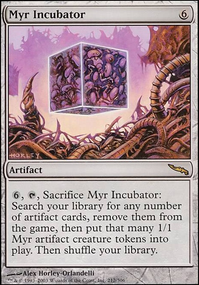 As for mana, do you own a Caged Sun or Nykthos, Shrine to Nyx ? Both are clutch in mono-color decks. Last, since you're playing artifacts, suggest replacing some of the high CMC beaters like Inkwell Leviathan with things you can cheat out like Metalwork Colossus . Tiny_Sir on Azorius Daxos Artifacts? 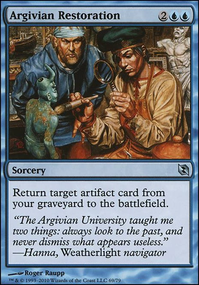 I've been moving around to deck after deck, but I always seem to come back to Azorius. Now I love control, don't get me wrong, but I wanted to try something new with this iteration. So, I decided artifacts! This build is mainly based around ramping with artifacts, using artifact synergies to get big battle-cruiser artifacts out, and steal out opponents things with cards such as Memnarch and Mind's Dilation . 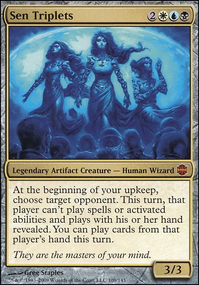 I'd love some more budget (no more than 10$ cards) options for the deck. I'd like to make this a strong 75% deck if I could over time. duff87 on Got a Hand Full of Treasure, Make it Hail!!! Mycosynth Lattice , bro, Mycosynth Lattice and Memnarch .. +1! 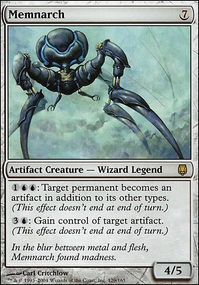 Mirrodin was actually created by Karn - it is an artificial plane. 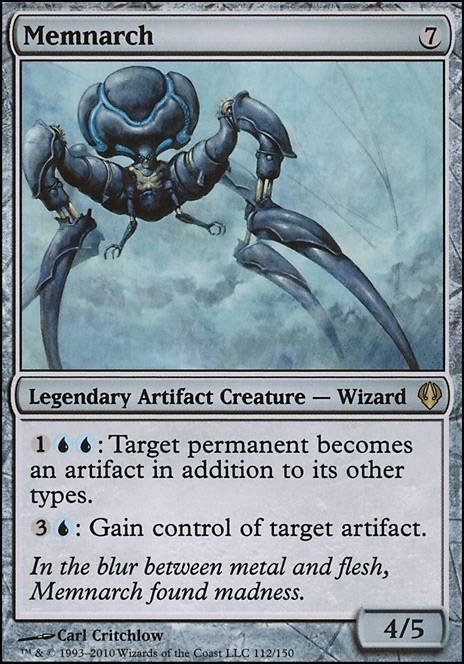 However, he always carried a bit of phyrexian oil with him that corrupted many on Mirrodin - Glissa Sunseeker was one of the custodians of the plane, but she became Glissa, the Traitor . Memnarch was the original custodian, but the oil drove him mad. 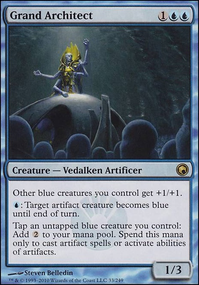 Capsize + Paradox Engine = With enough mana rocks to tap for we can bounce everyone's permanents forever. 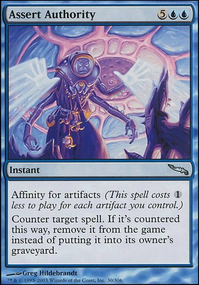 Nexus of Fate + Planar Portal = This is a late game win condition when we can generate to take infinite turns. I've often won off just controlling the board and stealing everyone's stuff with Memnarch or Oblivion Stone + Academy Ruins + Avacyn, Angel of Hope . Hope that helps!